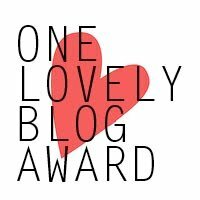 Nominated for One Lovely Blog Award! Career – my career has been eclectic at best. I started my professional life as a chemical engineer, went into purchasing, then switched into training and development, spent a couple of years in quality assurance and now am working as a consultant back in training and knowledge management. Accomplishment – one of the things I am most proud of is that my oldest son is graduating high school this year with honors. This is after a rocky start to high school. I am so glad he was able to learn how to focus his abilities to reach this point. Dream – my dream right now is to be able to retire in the next 10 years and be able to spend more time with my husband traveling the world. Hobby – I love photography and am looking forward to finding more opportunities to pursue this. I am exploring how I can share some of my favorite photos with a wider audience (right now just my family). Secret Skill – unknown to most people I enjoy sewing, particularly items for around the house, such as curtains, pillows, comforters, etc. Another thing I have not made time for in the last few years as I focused on family. Regret – I have very few regrets in my life, however I regret that my kids did not have a chance to know my parents since my father died when I was only 18 and my mother joined him when my oldest son was not quite 2. My boys are amazing young men who would have been the apples of my parents’ eyes and would have enjoyed knowing their grandparents. Favorite Place – I have been fortunate enough to see 46 of the 50 states and have loved many places and yet I have really fallen for Zion National Park in southwestern Utah. It is a beautiful, peaceful escape from the busy world. Sadly I will be moving away from this area so I am looking forward to finding a new favorite escape the chaos called my daily life. Here is a list of some of my favorite blogs. I enjoy reading these and they have inspired me as I have started my blogging efforts. http://organizedlivingessentials.com/, Thea always has interesting ideas on how to make your life simpler and more organized. http://theorganizedexecutiveblog.com/. The posts here always get me thinking about management and leading others. http://sellleadsucceed.com/ Tim Mushey’s insights into sales and motivation are enlightening for any part of business. http://spilledcookies.com/. I have appreciated Cherry’s look at life and the inspirational quotes she posts. I am truly humbled by this nomination. Delta Consulting Group LLC offers webinars, training and coaching to help you develop your skills in time management, teamwork and leadership. Visit www.delta-group-llc.com. Are You Creating Boundaries or Constraints? Do You Go All In?